California has more than one million motorized boats and an estimated four million recreational boaters visit marinas, lakes, rivers and the ocean every year seeking an enjoyable outdoor recreational experience. Oil and fuel contain harmful components which can affect human health and severely damage our aquatic environment (even very small quantities). A single pint of oil released into the water can cover one acre of a waterbody, impact drinking water and the aquatic ecosystem. As a boater, you love being out on the water and have a stake in clean, healthy waterways. In order to ensure that your experience is a safe and enjoyable one, it is important for you to follow some clean boating practices that will help to prevent oil spills in the water. Regularly inspect lines and hoses for deterioration, and fix small leaks that drip oil into the bilge. Also, replace oil pan gaskets and oil seals whenever the motor is removed for maintenance. This will reduce leakage and save you money in the long run. If you change your own oil, use a closed system -a portable vacuum oil change pump that drains into a closed container to prevent spills during transfer of oil to a recycling facility or used oil collection center (available at most marine supply stores). Recycle your used oil and used oil filter at a certified used oil collection center or call 1-800-CLEANUP or visit www.earth911.org for recycling locations. Oil absorbents are the least expensive method boaters can use to control oily discharges. Oil absorbents (available at most marine supply stores) absorb oil while repelling water and come in many shapes and sizes. Use oil absorbent sheets, pads or commonly known as “diapers” for oil drips under the engine and in the bilge and to remove oil sheen on the water. These absorbents can also be used while fueling your boat or when filling a portable tank. Absorbent Socks or pillows are designed for use in deeper bilge compartments. If you have an extremely oily bilge, consider using a bilge pumpout service that properly disposes of the wastewater. If the bilge and/or engine compartment still needs significant cleaning after bilge pumpout, use a steam cleaning service. Make a paste of equal parts of either lemon juice or vinegar and salt. Let the paste sit, scrub, and then clean with a rag. For more severe problems, scrub spots/bilge with borax/ water mix. See other alternatives for less toxic cleaning products. When using absorbents in the bilge, secure them to prevent clogging or fouling the bilge pump and the bilge pump float or sensor. Check saturation of absorbent periodically. When fully saturated, remove absorbent and place it in a leak-proof bag or container. How to discard used oil absorbents? 1. Oil Absorbent Exchange Centers: This service is offered by some marinas and fuel docks that actively distribute and collect oil absorbents for free. Ask your marina operator about local resources to properly dispose of saturated absorbents. 2. Bring your used oil absorbents to your County local household hazardous waste collection center. For locations visit Cal Recycle. Do not add detergents or bilge cleaning products to bilge water before pumping it out over the side into the waters. Also, never use soaps or detergents to clean oil or fuel on the water! It is ILLEGAL and bad for the environment. Absorbents that are exposed to soaps or detergents are usually rendered ineffective. 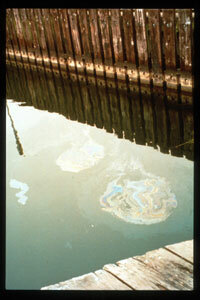 Federal and state laws prohibit the discharge of oil or oily wastes into or upon the navigable waters of the United States or the waters of the contiguous zone if such discharge causes a film or sheen upon, or discoloration of the surface of the water, or causes a sludge or emulsion beneath the surface of the water. What to Do in Case of a Spill? By law any spill that creates a sheen on the water must be reported. Identify and stop the source of the spill. Notify the marina for assistance. Call BOTH the National Response Center (1-800-424-8802) and the California Office of Emergency Services (800) OILS911. If you spill you are required by law to notify the authorities. If the fuel is oil or diesel fuel, contain the spill. DO NOT CONTAIN GASOLINE SPILLS because of its volatility and flammability. Properly dispose of used or saturated absorbents. In California, used oil absorbents are presumed to be hazardous waste. Dispose of the used oil absorbent at a marina collecting them or at your County Household Hazardous Waste Collection Center. Do not use soaps or detergents on a spill. It is illegal and bad for the environment. Federal law requires that oily waste discharge placards (available at marine supply stores) must be displayed on boats 26+ feet in the engine compartment or near fueling pumping station. Learn more about boat–to-boat mobile services. Learn more about environmental laws associated with oil and fuel. .
For your own health, the health of others and the health of the environment, it is extremely important that you, as a boater, take responsibility to implement clean and safe boating practices. · Regularly inspect lines and hoses for deterioration, and fix small leaks that drip oil into the bilge. Also, replace oil pan gaskets and oil seals whenever the motor is removed for maintenance. This will reduce leakage and save you money in the long run. · If you change your own oil, use a closed system -a portable vacuum oil change pump that drains into a closed container to prevent spills during transfer of oil to a recycling facility or used oil collection center (available at most marine supply stores). Recycle your used oil and used oil filter at a certified used oil collection center or call 1-800-CLEANUP or visit www.earth911.org for recycling locations. · Oil absorbents are the least expensive method boaters can use to control oily discharges. Oil absorbents (available at most marine supply stores) absorb oil while repelling water and come in many shapes and sizes. · Use oil absorbent sheets, pads or commonly known as “diapers” for oil drips under the engine and in the bilge and to remove oil sheen on the water. These absorbents can also be used while fueling your boat or when filling a portable tank. Absorbent Socks or pillows are designed for use in deeper bilge compartments. · If you have an extremely oily bilge, consider using a bilge pumpout service that properly disposes of the wastewater. If the bilge and/or engine compartment still needs significant cleaning after bilge pumpout, use a steam cleaning service. o Make a paste of equal parts of either lemon juice or vinegar and salt. Let the paste sit, scrub, and then clean with a rag. o For more severe problems, scrub spots/bilge with borax/ water mix. See other alternatives for less toxic cleaning products. · When using absorbents in the bilge, secure them to prevent clogging or fouling the bilge pump and the bilge pump float or sensor. · Check saturation of absorbent periodically. When fully saturated, remove absorbent and place it in a leak-proof bag or container. 2. Bring your used oil absorbents to your County local household hazardous waste collection center. For locations call 1-800 –CLEANUP or visit www.earth911.org. Learn how to use an oil absorbent. California Office of Emergency Services (800) OILS911, and to the marina office. · By law any spill that creates a sheen on the water must be reported. · Identify and stop the source of the spill. · Notify the marina for assistance. · Call BOTH the National Response Center (1-800-424-8802) and the California Office of Emergency Services (800) OILS911. If you spill you are required by law to notify the authorities. · If the fuel is oil or diesel fuel, contain the spill. · DO NOT CONTAIN GASOLINE SPILLS because of its volatility and flammability. · Properly dispose of used or saturated absorbents. In California, used oil absorbents are presumed to be hazardous waste. Dispose of the used oil absorbent at a marina collecting them or at your County Household Hazardous Waste Collection Center. · Do not use soaps or detergents on a spill. It is illegal and bad for the environment. Learn more about environmental laws associated with oil and fuel.